Carène fountain pen. The most distinguished Waterman. A black or vivid blue lacquered barrel, an 18-carat solid gold rhodium-plated nib and silver-plated trims all offer a truly modern look. Incl. 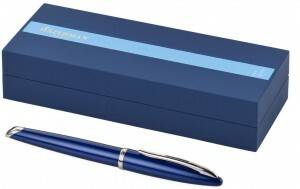 Waterman gift box and one cartridge. Exclusive design. Lacquered.